Your trackside guide to Autodromo Hermanos Rodriguez for the 2018 Mexican Grand Prix on October 25-28. The Mexican Grand Prix offers some of the best trackside atmosphere on the whole F1 calendar, especially in the Foro Sol stadium section. The weekend kicks off with an F1 drivers’ autograph session and other activities at the track from 16:00 on Thursday. In addition to more than 6 hours of on-track F1 action, the 2018 Mexican GP schedule features a support program with Formula 4, Porsche Supercup and Panamericana Series racing, all of which stage practice, qualifying and at least one race throughout the weekend. Gates open at 08:00. Expect airport-style security screening; more information about what you can and cannot bring into the circuit is here. No glass bottles or cans are allowed. Max 300mm lens on your camera. The circuit is separated into zones, which means you will be restricted to the area where your grandstand is located. It’s not possible to walk around and check out the views from different parts of the track. 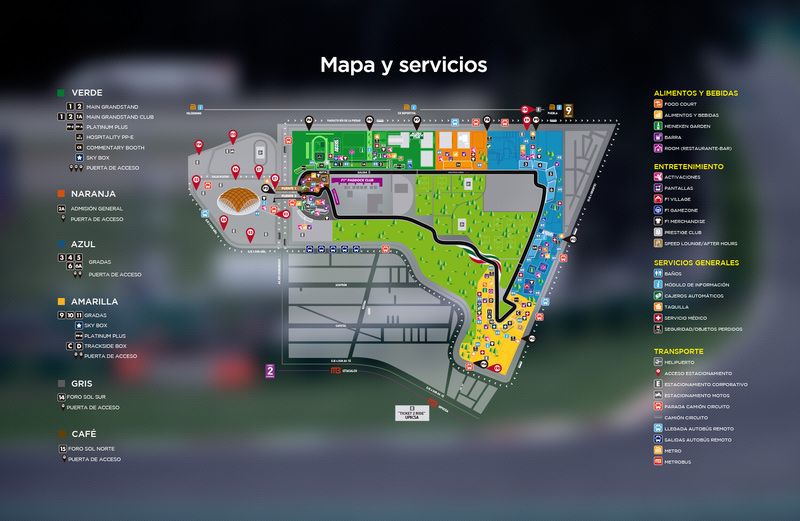 Check the MexicoGP website for the best entry gate for your ticket/zone. No parking is offered at the circuit. Get the metro or taxi/Uber to the track instead. More information in Getting There & Around. Be aware there’s no re-entry allowed at Autodromo Hermanos Rodriguez. Once you’ve entered the track, you cannot leave and return on the same day. Click here to download a detailed circuit map for the 2018 Mexico GP. Free WiFi is available for fans at the circuit! Download the “MexicoGP” app for IOS and Android to access more trackside information. F1 Vision is available and costs $1999 MXN (approx. $105 USD) for the weekend. Been to Autodromo Hermanos Rodriguez? Leave a comment with your trackside tips! Love your webpage! So helpful and informative. I am in Mexico this weekend in the blue zone stand 6. Do you know if you can get onto the track at the end or walk down to the podiums to see the winners ceremony? HELP!! My son is racing at the Formula 4 support race at the Mexican Gran Prix this weekend! Is it being televised somewhere? I am getting no information on this and need to watch his race from here in Canada! Any news on this? ?